You should look at the photo entitled Familial Exudative Vitreoretinopathy - Temporal Dragging first. 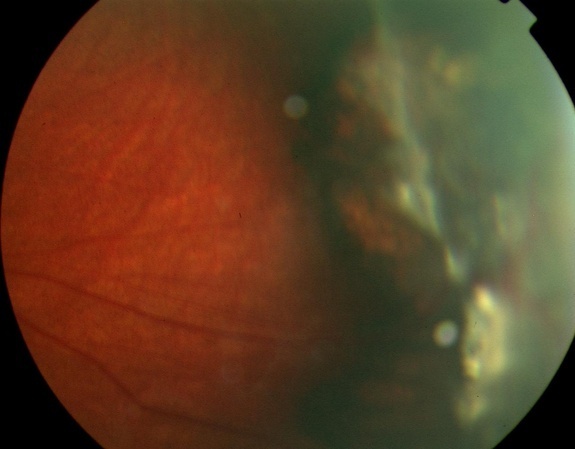 The dragged vessels in that photo are a consequence of the grayish scar tissue seen on the surface of the retina in this photo. The area of the retina shown here is just behind the iris and lens (the anterior retina) and is in the temporal quadrant, where familial exudative vitreoretinopathy usually produces such scars. Should the scar contract much more, a traction retinal detachment could ensue. Patients with this condition require lifelong follow-up.